Sophie Monat danced professionally with the Lille Opera Ballet and the National Ballet of Portugal. Following eight years as Ballet Mistress of the New Jersey Ballet, she served as Director of the Classical Dance Department at the Orange County High School of the Arts. 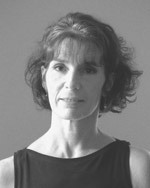 Currently on the faculty of the CSULB Dance Department, she is also Ballet Mistress to the State Street Ballet. Sophie teaches primarily at the junior/ pre-professional level. She is also part of the Summer Program faculty.